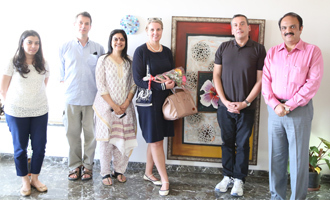 Eminent award winning Australian writer, Mr. Christos Tsialkos, visited MET Institute of Mass Media on 27th January 2015. He had an interactive book reading session which was followed by an interesting Q&A session with the keen students of MET IMM. His books ‘The Slap’ and ‘Barracuda’ have been adapted into a film and TV serial respectively and the students asked interesting questions ranging from copyrights issues and screenplay writing and adaptations from books into screenplays.